The arms race in the three-row crossover segment is showing no signs of cooling down, with redesigned vehicles on the way from established players like Ford as well as new entries from Hyundai and Kia. But if the idea of a rear-drive-based platform has you worried, or you'd prefer a vehicle from an established purveyor of big, high-riding family haulers, the 2020 Toyota Highlander is here. 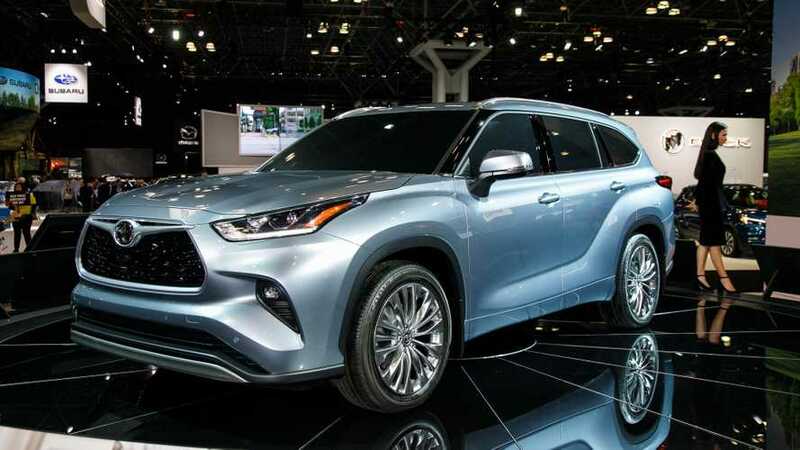 Debuting at the 2019 New York International Auto Show, the fourth-generation Toyota Highlander is like an amalgamation of everything we've seen from the Japanese giant over the past few years. The platform underpinning it is yet another member of the Toyota New Global Architecture (TNGA) family called TNGA-K. The Highlander shares the basics of this modular platform with everything from the baby Corolla compact sedan to the recently redesigned RAV4, Camry, and Avalon. Toyota engineered the platform to accommodate both the same twin powertrain setup as the current car, meaning this latest Highlander will continue to offer drivers the choice between a naturally aspirated V6 or a gas-electric hybrid. That said, the Highlander isn't making the jump to plug-in electrification just yet. The standard 3.5-liter V6 produces 295 horsepower and 263 pound-feet of torque. Nothing too surprising about that or the available 5,000-pound tow rating, as all the numbers match the 2019 Highlander. Going for the Highlander Hybrid results in a familiar pairing… for a Camry or Avalon. While the outgoing Highlander Hybrid features a 3.5-liter V6 and a pair of electric motors, the 2020 model drops down to a 2.5-liter, naturally aspirated four-cylinder, reducing total system output from 306 hp to just 240 hp. The upside is improved efficiency, although the 2020 model's 17 percent increase in fuel economy (from 28 miles per gallon combined to 34 combined) can't outweigh the 22 percent drop in horsepower. That said, Toyota has figured out how to offer the Highlander Hybrid with either front- or all-wheel drive, rather than just all-wheel drive. That should at least drive the electrified CUV's price down a smidge. Those powertrain tweaks hide beneath a revised body that softens the aggressive lines of the RAV4 and adds more of the cleaner styling from the Avalon. That said, the overall look is far more evolutionary than other recent Toyota redesigns. While designers thankfully did away with the razor-blade style grille, if you don't like the look of the current Highlander, you probably won't be crazy about the design of the new one. Ditto on the interior, which hews even more closely to the current crossover's design, although we're happier with that decision – the current Highlander's cabin is plenty nice. One big change for the cabin, though, is the expanded infotainment screen. Now with 12.3 inches of real estate, Toyota says the optional multimedia system is the biggest in the segment. That said, it's only available on the range-topping Platinum trim. Customers of lesser models will have to get by with a still-adequate eight-inch display. While the bigger display isn't standard, the Highlander follows the trend set by other new Toyota products and adds a comprehensive active safety suite as standard. The new Toyota Safety Sense 2.0 system replaces the outgoing model's Toyota Safety Sense P. While retaining the TSS-P suite (lane departure warning with steering assist, full-speed adaptive cruise control, forward collision warning with automatic emergency braking and pedestrian detection, and automatic high beams), it adds road sign recognition and lane keeping assist. As with Toyota's other new products, the Highlander's active safety gear comes standard regardless of trim. Toyota will offer the Highlander in five trims for the gas-powered model (L, LE, XLE, Limited, and Platinum) and four trims for the Hybrid variant (LE, XLE, Limited, and Platinum). That said, the company hasn't announced pricing yet. Sales of the V6 will begin in December 2019, with the Highlander Hybrid arriving in dealers in February 2020. For more on the 2020 Toyota Highlander, check out how it stacks up against the competition. And for more from the 2019 New York International Auto Show, visit our hub for all the latest.